Know exactly how much you have and how much it’s worth. 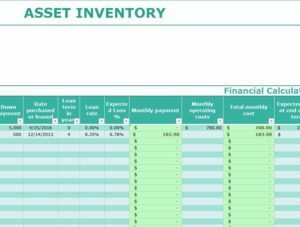 The Asset Inventory Template is great for businesses and collectors alike. You can simply download the free template and enter all your valuable items, along with key information about them to display on one template sheet. The Inventory Template comes with useful organizational information for businesses to use or edit. You can also edit the document to fit your store’s current system. This document is especially useful if you’re purchasing expensive items from the manufacturer and are involved in any loan repayment process. This template can help you track the most important financial elements of your business for free. Downloading the free Asset Inventory Template is as simple as clicking the link at the bottom of this page. Once you have the document open, you can see all the categories displayed in the header. The next step is to change/edit any information you find irrelevant for your store or business. Depending on the organizational system you have in place, you may want to change the “SKU” column or anything else that simply doesn’t work for you. If you need to change a pre-written item just click the cell you need to edit and write something else. You can also delete the item entirely using the same method. It’s completely up to you. Now, go through and enter all the information you need for your inventory, such as the item description, location, value, etc. As you make your way through the columns, you’ll see space to enter loan information. This is to help you monitor any inventory you haven’t paid off outright. This could include anything from major appliances you sell to actual machinery you use within your business. This template will also provide you with the means to calculate interest and depreciation with any loan items you enter. If you have your inventory item paid off, simply leave these columns blank. At the end of the inventory sheet, you will find totals for all your information at the bottom of the table. By using the Inventory Template you will be able to understand the value of your inventory, calculate loan items, and even determine overall loss for your company. This template is the perfect companion for any business owner.